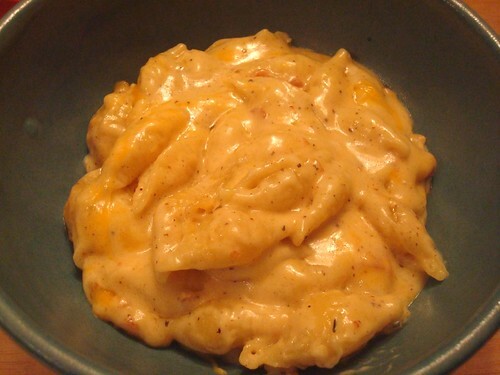 For Christmas dinner, the hubby wanted to do a "fancy" version of macaroni and cheese. So fancy we went! (Although after seeing the price tags on some of these cheeses...yikes!) We adapted this recipe to our taste. 1. This meal got pricey in a hurry--I about fainted at $30 worth of cheese. BUT, it was very rich and satisfying and a 9" X 13" pan is quite a bit of food so we got many meals out of it. The problem is that the cost doesn't scale down since you have to buy a block of cheese of a minimum size. 2. The sauce was thick and creamy and everything I love about really good macaroni and cheese in restaurants. The bacon was a nice touch and I probably would have been perfectly happy leaving the onions in. 3. This would be fantastic with vegetables in it. Yum! Some broccoli and perhaps peas might work as a good addition. I might have used green onions and left them in. It seems like a very intensive recipe! But it looks delish.